White Canyon is a tremendous Cedar Mesa canyon and that would be just fine. But then it narrows and deepens. You climb into the bowels of the earth, and are confronted with a pool that winds around a corner and out of sight. The water is very cold. You remember walking through the 100 degree heat and being very warm, but it does you little good now. You grab your pack and plunge into the pool, swimming around the corner, then another corner, then another corner. The frigid water spurs you on. Ahead is sunlight and gravel. You pull out of the pool and turn your pack upside down. Yeah! 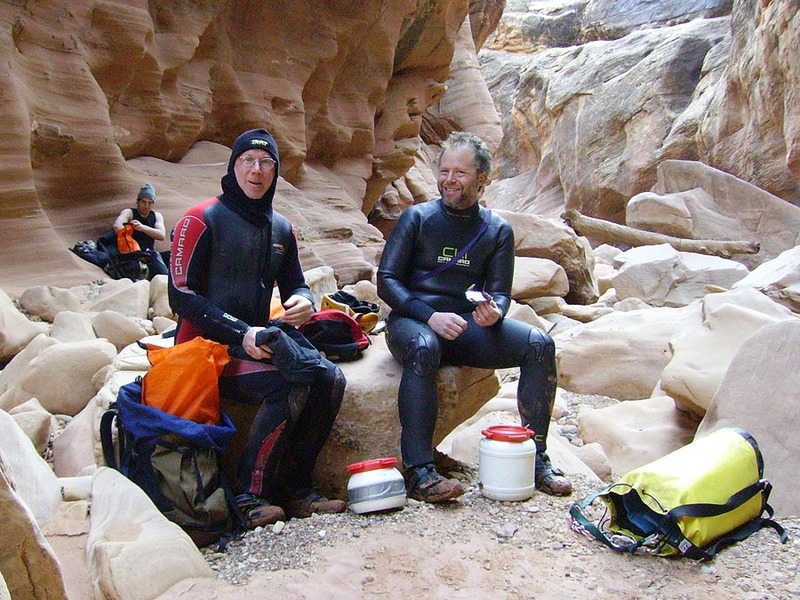 The Black Hole offers one of the longest and coolest swims of the Colorado Plateau. A rope might be helpful to aid the weakest members of the party, but with a little hunting around, non-­rappelling descents can be made at all the obstacles. The exit requires paying attention, and a little bit of route-­finding, but is otherwise straightforward. Most obstacles can be downclimbed, but a short (100 foot) piece of rope is helpful. Can be done as a loop hike or with two cars, using a car spot. Starts at MP 57 and Ends at MP 54.9 on Hwy 95. Dry bags for your gear. Have a lot of flotation in your pack. Very High: upstream, White Canyon drains a very large area. Avoid this hike when storms are in the area. Very long and cold swims. The exit requires a little bit of route finding, but is otherwise easy. Serious flash flood danger. You will drop in near Mile Post 57 and exit near Mile Post 55. On the north side of Highway 95, near MP 57, is a large scraped off parking lot, with a cairn and a well-­established trail leading north. Park here. If possible, spot a car at the bottom: at about MP 54.9. Follow the trail north to a side canyon. Descend with little difficulty (3rd class) to the bottom of White Canyon. If there is more than a trickle of water flowing in the bottom of White Canyon TURN AROUND IMMEDIATELY. The canyon bottom should be dry or nearly so. White Canyon stretches for 50 miles east from here. 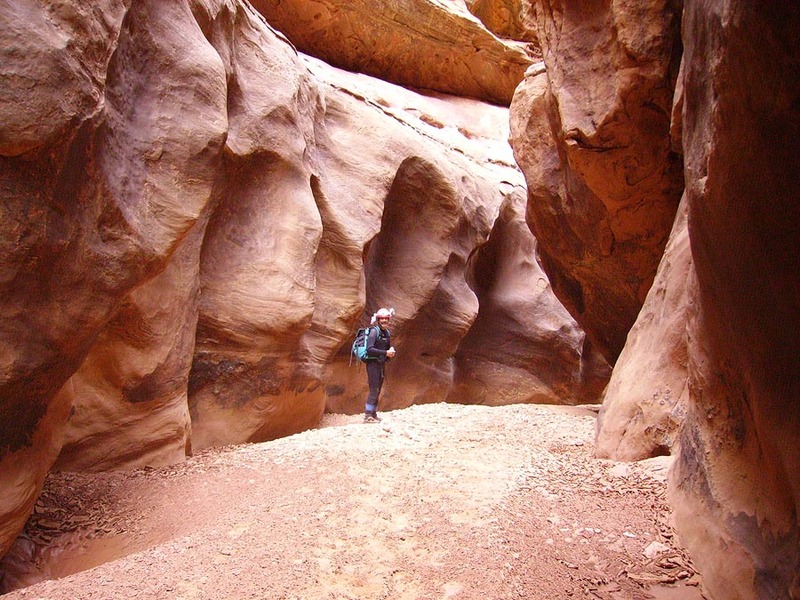 This extensive collection zone makes White Canyon one of the most dangerous narrows hikes in Utah. Any thunderstorm activity either currently or in the last 24 hours should be considered a no-­go for the Black Hole hike. Be Smart. White Canyon is fabulous. Four-hundred foot Cedar Mesa Sandstone walls wind their way back and forth. The canyon is at first wide and offers easy walking. After a mile or so, you start seeing pools and narrows, which at first are avoidable with a little scrambling and stemming. The canyon narrows and you arrive at the first obstacle. Scouting around will reveal a reasonable downclimb. The second boulder jam/pool/obstacle is easily scrambled past on the left. One could rappel into the black pool down under, but it's not clear to me that the swim offers an exit! The canyon pinches down more, and the real fun begins. A 10 foot drop can be downclimbed, or rappelled by looping the rope carefully around a large rock. The second pothole is exited by climbing a short wall on the right. The canyon has now worked deep into the rock. Light filters down from above. The water is cold and beautiful. Get in there and start swimming. After two wonderful long swims, we come back out to the "normal canyon" and reverse the procedure. After warming up a little, we still have a few pools to wade and swim, but not nearly as cold. And then we are back in a gravel floored, wide, 400 foot deep canyon. The Exit: The first exit is up a canyon on the left. It is easily recognized as the first canyon coming in at floor level, and is probably marked with small cairns and signs of traffic. With some scrambling, the canyon is ascended to the highway. At one point, a steep 20' wall must be climbed on large holds (5.7). This can be belayed from above, and packs can easily be roped up. Three other spots of fifth class climbing are required to escape out the head of the canyon. An easier exit is found as follows: From the narrow canyon, proceed downcanyon about 300 yards (1/8 mile). Look for a large diameter, vertical, cylindrical column on the left (left looking downcanyon), whose base is about 100 feet above the floor. The cylinder column is very obvious as you approach it. Look for cairns. Work your way up the ledges to the left of this column, then head downcanyon, angling up slightly past the base of the column and around the next outcrop following the faint hiker made trail. Just beyond is a seam heading up and to the left that goes all the way to the top. The distance from the column to the seam is approximately 100 yards. Scramble up this to your car at MP55. This exit is YDS class 3 and very well cairned. GPS for the exit point on the canyon floor: 12S 0558347 mE, 4185590 mN. FreezeFest XI - The Black Hole for New Years! 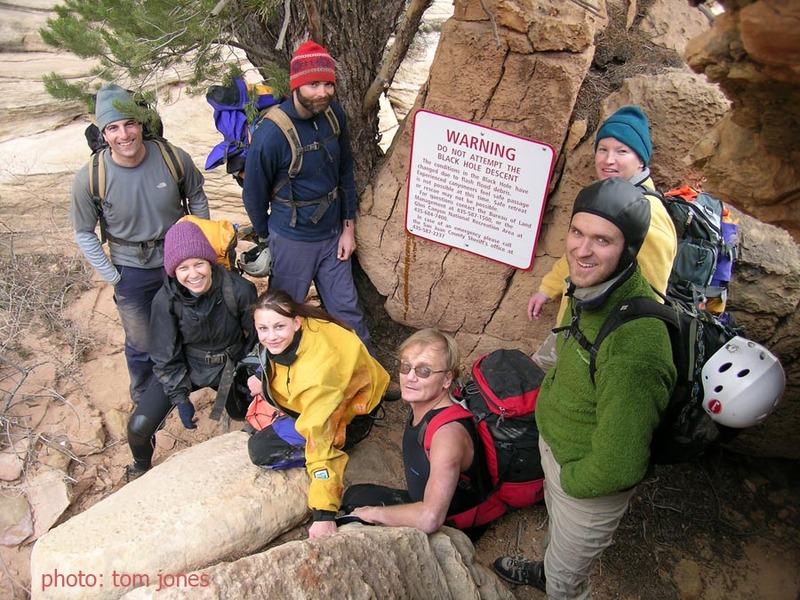 Freezefest is an annual gathering of hearty (ie, foolish) canyoneers for canyoneering at the turn of the year. Camping out in single-digit temperatures may not seem like it would be fun, but with proper preparation, plus lots of firewood, fine spirits and good friends, it works out to be one of the funnest events of the year. FreezeFest V: The Black Hole for New Year's Day! Finally the big day dawns. No sense getting an early start, we mosey around camp awhile, then pack for the drive to the Black Hole. Mr. Dave Black joins us once again. Here's Malia's group shot, in the parking lot. FreezeFest III: The Black Hole for New Years! You get to sleep in on Hole day. After sipping scotch at midnight and a restful sleep, the call went out at 8 AM. The sun was up, offering one of the few sunrises of note, on the trip. A new tradition. The Black Hole for New Years. Ram rounded up a bunch of folks, most of whom backed out when they checked the weather forecast. So off with a small group of die-hards to the slots of North Wash for a little Mae-Westing before the Hole. I, like several other folks I imagine, had wondered for a long time... does the Hole freeze solid in winter? Open water? A nightmare of thin, break through ice? Inquiring wackos want to know!